The end of the year and the start of a new one heralds not only a time to look forward at goals to be accomplished, but also to celebrate the seasons that have wrapped and analyze what went wrong, what went right and what lessons were learned to be relied upon in the moments of truth next year and the years to come. 2018 was a year of firsts that ended in not-quite-firsts and season-saving moments that created great memories in the field and on the water. By far the biggest disappointment was shooting my first buck with the bow. I say disappointment because I hit the deer too far forward and spent nine of the next 13 hours scrounging drops of shoulder-area blood from streamside grasses and running serpentine patterns through the brush the following day in the area where the nice four-by-four jumped the flow and then vanished into the standing rows of September corn, leaving no more crimson to follow. I’ve experienced no greater frustration in the outdoors, and while in 2017 I missed the first buck I had ever shot at, this feeling was far worse than a clean miscalculation of distance brought on by adrenaline. While the deer’s appearance was so quick, I had little time to endure buck fever this time around, I am quite certain now that the split second or two I had to see his gleaming white rack towering above and around his ears had something to do with my shot placement. If anyone knows of a cure for buck fever – I’ve tried thinking about baseball, doing multiplication tables and reciting the 50 states – please email me. Equally as frustrating were a few downed pheasants my young dog was unable to find at the start of the season and the spiraling searches I had to undertake to find them on my own. My lab seemingly had no idea where to look when the call of “dead bird” came out as the roosters crash landed. The first was one lost in light grass on opening day. The following pair was my first double in many years which I had to retrieve on my own, winding through the uncut wheat along the small cattail drain we were hunting until I stumbled across them both, all with my dog dragging his tail behind me. Our young relationship was challenged by these early issues, but as the season progressed, Ole found his mark every time, ending the year with seven straight blind retrieves. A rooster running through the cattails – found. Four birds dropped in deep, snowy slough cover on one hunt – all nabbed. Two more runners in open grass and hillside brush in late season – snagged. After those opening trials, it has been a solid close to the season, adding ideas for future training exercises with wings in thick cover in the upcoming offseason to keep him sharp. While my first hooked salmon went about the same as the buck above, it connected me with a passion of cruising, adjusting depths and crafting my own trolling lures for seasons to come – not to mention an investment in some new hardware for my boat. 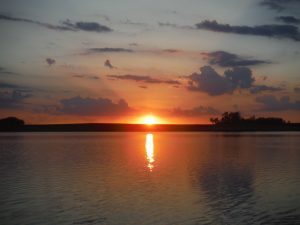 The addition of downriggers, a couple new rods, a selection of flashers, and more plastic squids and flashy skirts for trolling in the depths of lake Sakakawea show the impact that yet another one that got away has had on my year – and my plans for late summer of 2019. Of all my goals for the outdoors next season, catching my first salmon is at the top of the list. Besides, I need to start reducing the price per pound from infinity. Perhaps the standout moment of 2018 came when my son, AJ, landed a trout – his first – on our initial ice adventure of the year. His gleeful, non-stop reeling that bonked the fish a few times on the bottom of the ice before it came up the hole leads me to believe that the fates in the outdoors favor the young, as I don’t think I’ve ever brought a fish up that I’d given a solid bonking on the base of the ice hole. His smile said it all as we set the fish free back into the crystalline waters below us and closed out the day with a grand tally of one, which helped me realize that sometimes, one is all you need. The past 12 months comprised a year of lesson learning. Challenging times in the field and on the water turning into good times and great memories with friends and family and a jumping-off point for the coming year. Whatever 2019 brings, the learnings of the past year and the wonderous things remembered will all factor into my further enjoyment…in our outdoors.